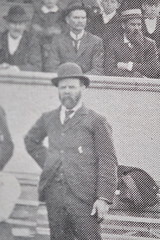 Harry Richards was the youngest son of John Richards and Mary Mullis Richards, who arrived in South Australia in 1854. Harry, however, was born in Willunga in 1861. In 1886, he married Margaret Anne McBurney from Aldinga. Harry and Margaret produced 8 children. In 1897 the family was rocked by tragedy when the eldest son, 10 year old Gordon, was thrown from his horse which then stepped on his head, shattering his skull. Death was thought to be instantaneous. since it was opened, a very material factor in quality. Harry was also an agriculturist – in 1904, he advertised a variety of vines for sale, namely cabernet, shiraz, currants, mataro, muscatel, and doradillo. Harry also carved a couple of gravestones after the death of his brother John, a gifted slate carver. Harry took a leading role in advocating for a railway line to Willunga. By 1909, the Willunga Railway was a matter of controversy, and a challenge that Harry threw himself into with gusto. In a letter to the Adelaide Register Harry challenged the Engineer-in-Chief and Commissioner of the Railways on the veracity and thoroughness of evidence presented to the Royal Commission (Willunga Railway, 27 April 1909, Register, p. 8) . Using a horse and trap, Harry visited all the towns from Brighton to Yankalilla, holding public meetings and garnering support. Then on one memorable day, Harry led a deputation to Parliament House and Parliament granted permission for the construction of a railway from Marino to Willunga. Although the railway was to bring a new prosperity to Willunga, for Harry the work, stress and continual effort imposed a heavy toll. On 8 April 1911, at his home in Willunga, Harry Richards died suddenly. After his death, his widow Margaret opened a refreshment room in the front room of their home to cater for train travellers to support the family. Harry Richards, 1 September 1903. Do you remember Richards, Harry ? Then Join up and add your memory here.